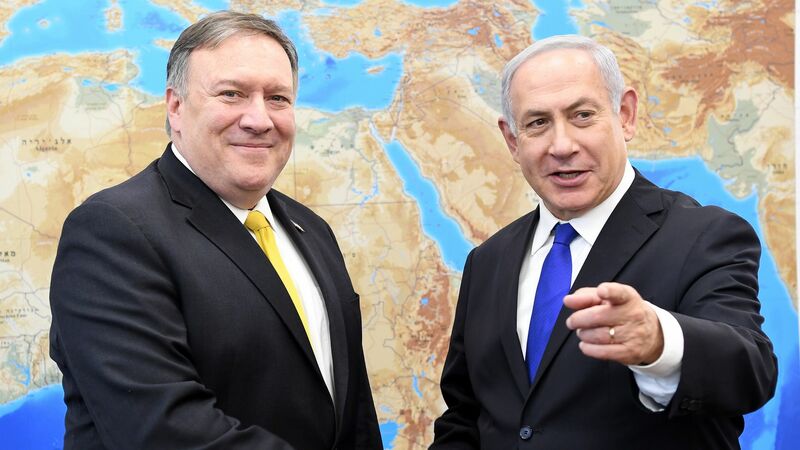 Secretary of State Mike Pompeo will meet with Israeli Prime Minister Benjamin Netanyahu in Brussels on Monday. The meeting, which was announced by the Israeli side only this morning, will deal with Iranian activity in Syria and Lebanon, according to Israeli officials. Why it matters: The timing and the venue of this meeting are a bit out of the ordinary. Israeli officials told me the venue was chosen because it was the "in the middle of the way" between Washington and Jerusalem, adding the meeting was originally planned to take place on Wednesday in Milan but the time and place have changed because of President George H.W. Bush's funeral. The State Department did not announce the meeting with Netanyahu in advance and did not release Pompeo's daily schedule on its website — and its statement on Pompeo's trip to Brussels released this morning doesn't mention the meeting with Netanyahu. Details: Before taking off from Tel Aviv, Netanyahu said that he will discuss with Pompeo "the Iranian aggression in Israel's northern border." Israel remains concerned with Iranian military entrenchment in Syria and with the precision missile factories Iran has been building for Hezbollah in Lebanon and wants the U.S. to press the Lebanese government to prevent the building of the missile factories.